Cucumber sandwiches, fresh tzatziki, and home-canned pickles can all be yours with a little preparation and modicum of effort. In the Bay Area, you may find your cucumber vines out of control with way more cukes than you and your family can handle. What Cucumber Type works for you? Cucumbers listed in seed catalogs are categorized as “pickling” or “fresh eating.” Some say “burpless” or “not bitter.” Others are listed as “hothouse.” Some claim to be good for everything you could ever imagine (for a cucumber). How to choose? In some cases, pickling varieties are more bitter–they won’t taste great without processing, such as pickling. If you are expecting to pickle all your cucumbers, go for this type, as they will be the right size. 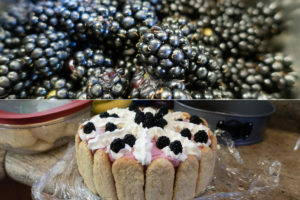 If you want to eat them fresh, most other varieties will work great, so go for what will work in your garden’s microclimate. These are the kind you’re most likely to find in the supermarket. These are sold when 6 to 8 inches long and are usually dark-green and waxy (a coating to keep them from losing moisture). Hands-down, my favorite variety! 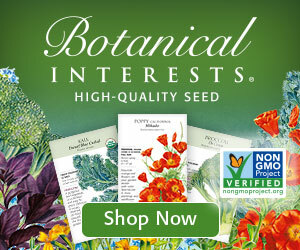 Grows prolifically in our weather, pollinates well, and does not not easily succumb to cucumber beetle damage. They taste fabulous even if you leave them a little too long on the vine, are never bitter, and work well for fresh-eating. These keep producing for a long time (in 2018, I was eating ripe fruit well into November!). These also have small easily-removed spiny nodules that commercial cukes have removed before they arrive at the store. At the store, these will be over a foot long and are wrapped in tight plastic instead of wax. These are less plump, but tend to have less or no seeds at all, and some call these “burpless” and consider them easier to digest. These were cultivated to grow in greenhouses, but can be very happy outside. 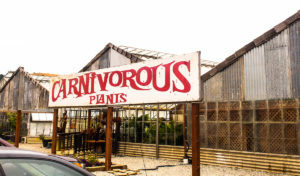 They will require trellising for best results. These are smaller cucumbers meant to be picked when they will still fit whole into a canning jar. These are sometimes appropriate for fresh-eating when they get longer–check your seed packets and catalogs for info on particular varieties. There are visually impressive types, like Lemon, or snack-size mild types, like Persian, or stunningly different like Armenian. Lemon: Grows round and yellow, like a small, tender pumpkin. A healthy Marketmore cucumber vine growing in a Slug & Snail Force Field. Good practice is to choose your spot in the garden for your cucumbers, expecting your vines to spread between 6 and eight feet around, or up a trellis, saving space. The spot should be in full sun most of the day in the summer, and should be at least 6 feet from any other plant. Make a small mound in the area you choose and plant your seeds. Keep the mound consistently moist. 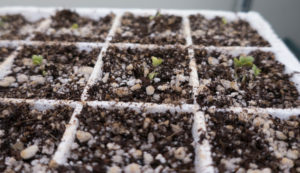 Of your 3-6 seeds planted, be prepared to only allow 2 or 3 plants to survive to adulthood. If all 6 seeds sprout and you let them all grow to maturity, all vines will be stunted due to the competition. 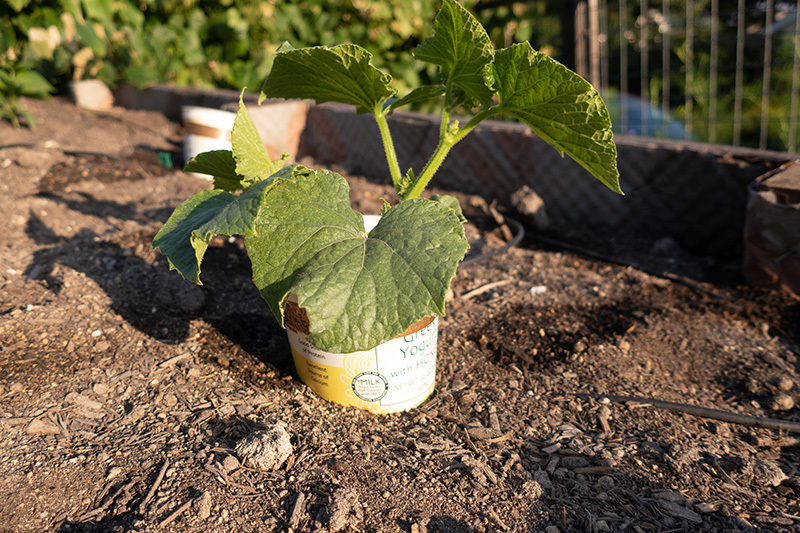 Cucumbers are one of the plants slugs and snails like to snack on, leaving you a nubbin of stem where your baby plant used to be. I highly recommend making Slug and Snail Force Fields to keep your baby cukes alive. They are cheap to make, reusable, and, if you make the tops, you’ll get a greenhouse/cloche effect that helps your seeds germinate. 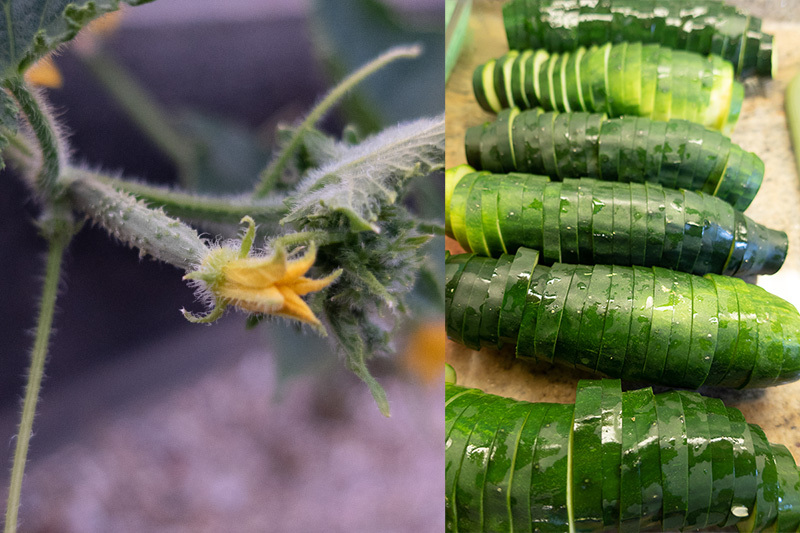 Bees and other insects will pollinate your cucumbers in most cases, but, if you’re like me and impatient for your first fruit, you can manually pollinate cucumbers yourself. A female cucumber flower. You can see the tiny proto-cuke under it. First, learn the difference between male and female flowers. Male flowers stand alone on a stalk. Female flowers grow at the end of a baby cucumber. Don’t worry if you can only find one type of flower on a young plant–that is normal. Eventually, you should have a few of both types. Next, find a male flowers and carefully pluck it from the vine. Then, remove the outer petals, leaving the base and stamen untouched. Finally, holding the male flowers carefully, touch it gently to the center of several female flower. If you have a lot of female flowers, use multiple male flowers in case you run out of pollen on the first one. When hand-pollinating, be sure to do it when the flowers are dry and open. You should see those pollinated fruits continue to grow into a full-size fruit. If a fruit fails, it will shrivel and fall off the plant. On the left, a cucumber that has not been pollinated. It will shrivel more and fall off the plant. 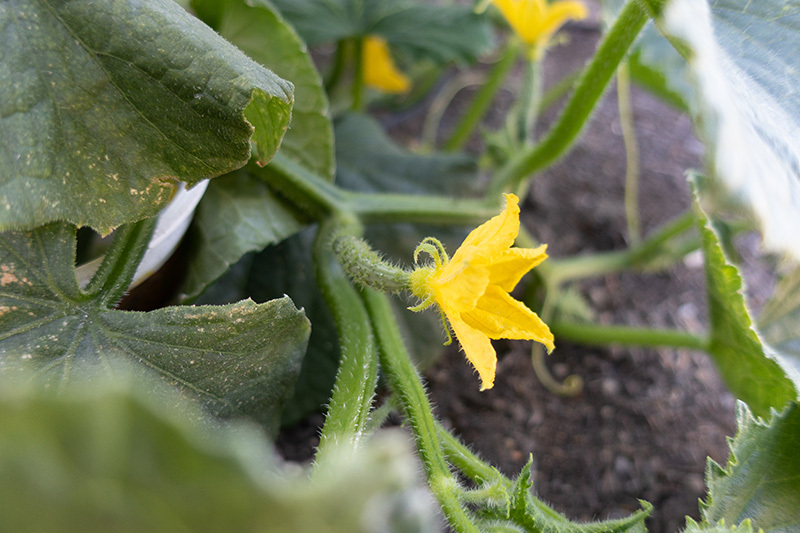 On the right, a growing cucumber fruit–only the flower will shrivel and fall off. Cucumber beetles are a cucumber’s worst pest. 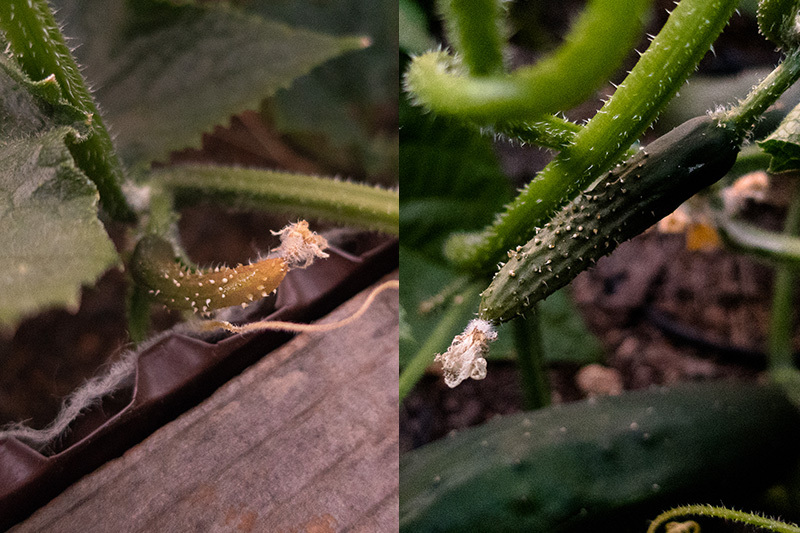 Strangely, you don’t see them ever until you grow cucumbers or squash, and then you’ll find their annoying dapper-striped-butts all over your plants. They are just addicted to cukes, and probably came to your garden by way of a close neighbor’s. 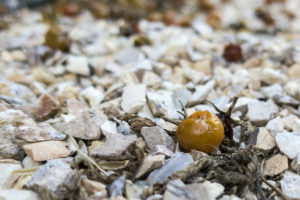 These (unfortunately) cute beetles will only multiply if you let them live. I recommend squishing any that you see immediately. The damage they do is usually not much, but the holes they crunch in your vines can lead to infections and other infestations. Slugs are a problem only when your plants are newly sprouted, and when they fruit. 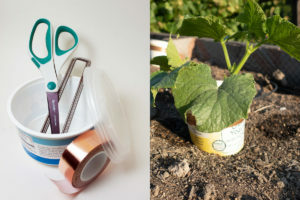 Slugs and snails can devour a cucumber seedling in a single evening, so I recommend a [force field] to protect them when young and tender. If moisture can be found under the blanket of cucumber vines, slugs and snails will show up and start gnawing on your cucumbers. If you live in a SUNNY area and keep watering focused on your plant’s roots only, you will keep the ground beneath the leaves relatively inhospitable to those slimy pests. You can also trellis your cucumbers to keep the vines off the ground entirely. Bigger is NOT better when it comes to cucumbers. They may look impressive, but large cucumbers mean the seeds inside are maturing–and those seeds are bitter and harder than the ones in tiny cucumbers. Pick early and often! Depending on the variety, you’ll want to harvest when the fruit looks less wrinkly, or just when the fruit reaches the size listed on the seed packet. Pickling varieties will benefit from even earlier harvesting. 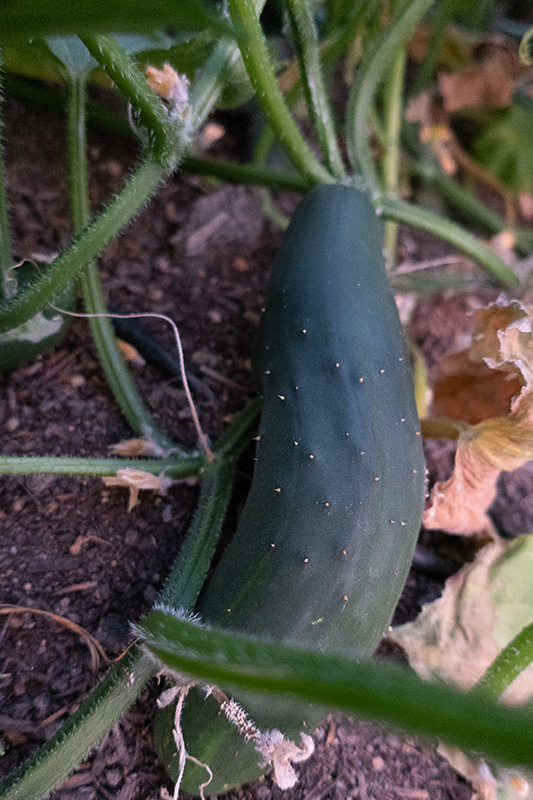 The more you harvest, the more the plant will continue to produce–and vice versa: leaving mature cucumbers on the vine makes the plant slow down production. A healthy, ripe cucumber ready to harvest. To pick most varieties of cucumber, you will need a pair of clippers to snip the stem close to the fruit. The stems and leaves are rough on the hands, so picking without clippers can be itchy and painful. Also, ripping the fruit off with force can damage other parts of the plant. Do take care to be sure you are cutting the stem of the fruit, and not the vine itself. I have made this mistake before when the cucumbers were hiding well under thick leaves, and ended up pruning half of a cucumber vine just to harvest one fruit. So disappointing! Last year, my three Marketmore vines produced at least 100 cucumbers. Of course, a given season’s weather, soil, and water all contribute to yield, so results may vary, but be ready to deliver bushels of cucumbers to friends and family if you grow too much for yourself.